The Greater Fayetteville Apartment Association is a huge advocate of Community Outreach! 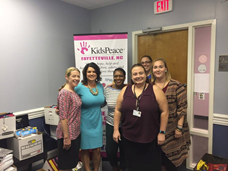 Each year, we have a dedicated charity that we work closely with to get our members involved in making Fayetteville and the surrounding areas a better place. For 2018, the GFAA has partnered up with our local chapter of Kidspeace. Kidspeace is a non-profit organization that provides services to children, biological families, and foster families in the communities where they live, in an effort to ensure continued health and happiness for every kid. They offer a spectrum of mental health services that include outpatient mental health clinics, partial hospitalization, autism-specific services, as well as in-home and education services are offered. They do such much for the foster care children in our territories. Our local KidsPeace oversees approximately 40 children + at a time. The staff of this organization comes to speak to our members at our monthly Membership Meetings to raise awareness, hosts their own charity events, and we participate by being their sponsor in the annual Chair-ity Auction (https://www.facebook.com/ChairityAuction/). We host drives with our properties and vendors to raise supplies for them. We also reach out to other local businesses to challenge them to donate as well. Our most recent drive was for school supplies. With the ever-rising cost of what it takes to send a child back to school – we promoted this drive on our website, via email and our social media outlets to gather as much as we could for them! What a success to fill their office with these supplies, and they are so grateful and such a pleasure to work with. They have a special place on our website and in our hearts. We encourage YOU to assist the GFAA in supporting KidsPeace. What's Your story? AANC wants to hear from you. Tell us all of the good happening at your company or association to be highlighted on AANC Online!